The trombone is one of the most widely used of all the brass musical instruments. Valued for its ‘vocal’ and unique tonal qualities, most trombones are played by the musician vibrating their lips while blowing into a mouthpiece and manipulating a telescoping slide to change notes and pitch. The trombone is the only member of the brass family to feature a slide. Some trombone-styles also feature one to three valves, similar to those found on trumpets, while a few styles can have five or more. The trombone is a very old instrument dating back to the 17th century and was widely used in the European orchestras of the day. The name trombone is loosely derived from the Italian words for ‘big trumpet’. Evolving through the centuries, the trombone is routinely found in symphonic and operatic orchestras as well as jazz, rock, brass, big band, blues, salsa, and other Latin music bands and combos; high school, college and military marching bands; brass quartets and ‘trombone choirs’; and are used as solo instruments. At its most basic, a trombone (also sometimes called a bone, T-bone, or slide-bone) is a long metal tube bent into an ‘S’ shape which tapers at various points and ends in broadcasting, flared ‘bell’. The bore (or interior size) of the metal tube will determine the pitch of the instrument; small-bore trombones have a sharp, focused sound while a larger bore will produce a larger, warmer sound. Likewise, the size of the bell will determine how loud the instrument can be played, and how well it broadcasts. Trombones usually feature a slide, which the musician pushes down to lower the pitch by making the tube longer, and pulls up to make the pitch higher. A mouthpiece is attached to the end opposite the bell; the musician blows into the mouthpiece while vibrating his or her lips, creating vibrations in the tube which produces musical notes. Trombones are generally made of brass and are sometimes offered with lacquer or plated finish. Sterling silver is also sometimes used in their construction, and these are usually more expensive. Recently, some manufacturers have started marketing trombones made of plastic for students and beginners to learn on. As with most musical instruments, the price you will pay for a new trombone can vary greatly and will be based on the style, quality, material, and manufacturer. For example, a basic starter trombone can be had for as little as $100, while an orchestra-quality professional trombone can run $7,000 to $10,000 and higher. Additional expenses will include a case, mouthpiece, and special oil for the slide (and valves, if applicable). Many music stores and online retailers also offer used trombones for sale at markedly reduced prices. Larger music stores will also usually offer trombones for rent; this can be a particularly good option for beginners, as well as for parents whose children are participating in school music programs. So, what are the different types of trombones? The straight tenor trombone is among the most popular, simplest and user-friendly instruments in the trombone family. Tuned to Bb (b-flat) during their manufacture, this instrument is comparatively easy to play and is often what aspiring musicians will learn first before moving on to more sophisticated and specialized types of trombones. This is one of the lighter trombones, usually weighing between 15 and 20 pounds. But the straight tenor trombone is not just for beginners; it is widely used in jazz, brass, rock, reggae and Dixieland bands. Standard straight tenor trombones use seven positions on the slide, with each descending (lengthening) position decreasing the pitch of the instrument buy a half-tone (also called a semi-tone). While the lower range of this instrument is limited, the upper range of notes this style of trombone can reach depends almost exclusively on the experience of the musician playing it, and is considered by some to be virtually open-ended. In terms of price, straight tenor trombones can be had for as little as $300 and can climb all the way to $2,500 and higher for a professional quality instrument. This is considered to be one of the most durable and trouble-free of all trombone types, due to its basic design and construction. 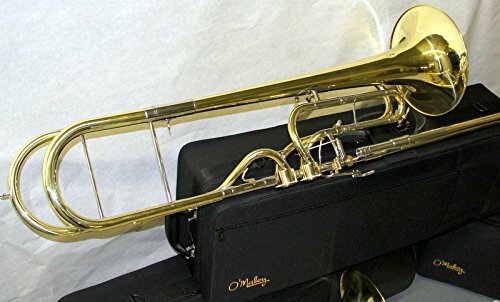 A widely used variation of the straight tenor trombone, the tenor trombone with F attachment (also called an F-rotor, trigger, or Bb/F trombone) is longer and slightly heavier than its tenor cousin, usually including an extra three feet of tubing. When triggered, the trombone’s pitch is lowered to F from the standard Bb. There are two basic types of F attachment tenor trombones: open wrap, and standard (or traditional) wrap. The open wrap variation allows freer movement of air through the instrument, while the standard wrap increases resistance but is more compact. Which F attachment is used will be largely a matter of the personal preferences and skill of the musician, as well as the type of music they most frequently play. Largely because of the increased number of notes available in the instrument’s lower range, the tenor trombone with F attachment is used in everything from orchestral and operatic to ska and pop music – and most types in between. Considered one of the more basic trombone types, this is very often the trombone that beginning students will graduate to after mastering the mechanics of the straight tenor. Tenor trombones with F attachment tend to be a bit more expensive than straight tenor trombones due to the additional complexity of the instrument. Prices will usually range from $500 to $3,000 and higher. About the same length as a straight tenor trombone, the bass trombone (also sometimes called the tenor-bass or B/F/E trombone) has a bigger bore and bell than either the straight or F attachment tenor and is consequently a larger and heavier instrument, weighing anywhere from 20 to 22 pounds. 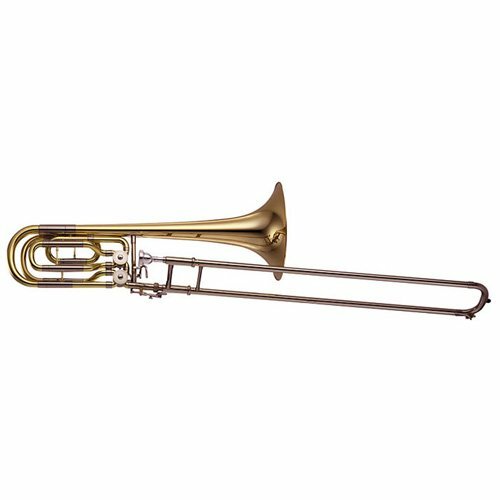 The bass trombone is tuned to Bb and features either one or two valves which will extend the instrument’s range into D, E, and F, making it one of the most versatile trombones around. Because of its rich, strong tones particularly in its lower ranges, the bass trombone is often found in symphony orchestras, although it is also widely used in brass, salsa, and jazz bands. It is also quite frequently used for trombone solos, particularly in jazz and swing compositions. A new, good quality bass trombone can be quite expensive, often running $4,000 or more for a higher end, two-valve model. Cheaper, single valve models can often be found for under $1,000 if you are willing to sacrifice on tonal range and sound quality. Because of both the weight and complexity of the instrument, the bass trombone is not recommended for younger or beginner players. Not normally found outside of symphonic or operatic orchestras, the alto trombone usually comes tuned to Eb (although they will occasionally be offered in F), and sometimes feature a Bb or D valve. Widely used in the 18th and 19th centuries, the alto trombone almost disappeared during the first half of the 20th century but has seen a resurgence in popularity in the last few decades. It is usually used to play many of the higher trombone parts in orchestral pieces. Alto trombones tend to be lighter weight than some other trombones, in large part due to their shorter slide and smaller bore. Because of this shorter length, slide action is faster on these instruments allowing the musician to play quick, complex musical parts more easily than is possible with other slide trombones. Many of the trombone solos in classical music are written specifically for the alto trombone. Alto trombones tend to be on the higher end of the spectrum when it comes to price. It is not uncommon for an alto trombone to cost $2,000 to $4,000 for an orchestral quality instrument. As something of a specialty instrument, they can be hard to find outside of large music retailers. They are usually not offered for rent. The contrabass trombone is one of the largest and heaviest trombones used today. With a very large bore to allow freer air-flow and a 10 or 11-inch bell, the contrabass is usually tuned to the key of F (although it can sometimes come in C or Bb) and is usually found in symphonic or operatic orchestras. It can also often be heard in movie and television soundtracks. Played at its lowest registers, the contrabass can reach many notes typically reserved for the tuba and, in fact, often takes a tuba mouthpiece. In the past, most contrabass trombones featured a ‘bent’ bell design like the tuba and a slide extension (placed on the interior of the slide to allow the musician better extension to reach the lowest pitches) so as to make it more compact and better able to fit in standard orchestra pits. In the last few decades, however, the straight, standard trombone configuration has become the most popular and widely used. Today, contrabass trombones produce one of the lowest sounds of any commonly used trombone. It will usually come with one or two valves, and many are offered with a double slide configuration wherein the slide is wrapped around itself once, giving the instrument a broader range of notes than was possible with the previously used bent-bell type. Because there are relatively few parts written specifically for it, this instrument is often played by the bass trombone player in many orchestras. The contrabass trombone is on the higher end of the scale price wise, usually running $2500 to $5000 and higher for a good quality instrument. Because if its popularity in high school and college orchestras, it is commonly offered for rent by larger music stores. Unlike most members of the trombone family, the valve trombone – as the name indicates – uses valves like those found on most other brass instruments instead of the normal slide to change notes when it is being played. Although it does not incorporate a slide, in most other ways the valve trombone resembles standard trombones and is usually about the size of the straight tenor model. Normally manufactured in Bb (although many other keys are available), the most common type of valve trombone uses a three-valve system, similar to that found on a trumpet. There are some specialty valve trombones available including one with seven valves, matching the slide positions on a standard slide trombone, but these are rarely used. The valve trombone lacks the open, rich tones produced with a slide, and so is rarely used in symphonic orchestras or classical music in general. However, as the manipulation of the valves allows the musician to play faster, more complex pieces of music, the instrument is very popular in jazz, salsa and other types of Latin music, and pop. It is also widely used in high school and college bands and is often a second instrument for trumpet players. The valve trombone is generally one of the lower cost trombones (about the same as the straight tenor with F attachment) and will typically run under $500 for a starter all the way up $2500 for professional quality. The marching trombone (also sometimes called the flugelbone) is a relatively new member of the trombone family. Resembling a flugelhorn (hence the nickname), the marching trombone is one of the most compact trombones available and therefore perfect for use in marching bands, where it is almost exclusively used. Most frequently produced in the Bb key, it is tuned a full octave lower than a trumpet and approximates the sound of a full-size trombone quite well. The marching trombone is a three-valve instrument and does not utilize a slide. 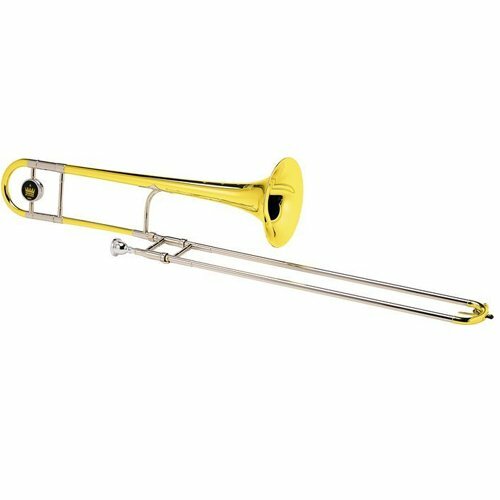 The marching trombone is also much lighter and therefore easier to carry than a standard slide trombone, increasing its value as a marching band instrument. In some smaller marching bands, it is often used by trumpet players because of its similarity in size and valve design to the trumpet – particularly in more sophisticated pieces of music. The marching trombone also matches up well with trumpets when it comes to price. A relatively low-cost instrument, prices will normally range from $300 to $1500. The soprano trombone is usually used as a utility instrument and is often used by trombone players who normally play a different style of trombone or trumpet/coronet players who have mastered the use of a slide. Also sometimes called the slide coronet, the soprano trombone is one of the smallest and lightest versions of slide trombone used today. Normally manufactured in Bb and tuned a full octave above the straight tenor, the soprano trombone was once very popular in classical and particularly opera scores, as its range is designed to complement that of a soprano vocalist. Today, it has largely been replaced by woodwind instruments and the coronet in orchestras. It is still frequently used in jazz and swing bands. Soprano trombones have a very small bore and a bell about the size of that found on a trumpet, and often use the smaller trumpet mouthpiece, making them relatively difficult for most trombone musicians to play. The slide is also significantly shorter than those used on other trombones and usually has only six positions as opposed to the standard seven, decreasing its range and versatility. Despite being a specialty instrument, soprano trombones fall into the lower end when it comes to price. Another utility-type/novelty instrument, the piccolo trombone is the smallest of all trombones. Used almost exclusively in jazz, novelty, and ‘trombone choir’ music, the piccolo trombone is tuned to Bb. It is two full octaves higher than the straight tenor and an octave higher than the alto trombone. About a quarter the size of the straight tenor, the piccolo trombone (also sometimes called the trumpet trombone) has the smallest bore in the trombone world. This instrument has a bell about the size of a standard trumpet and utilizes a trumpet mouthpiece. The piccolo trombone is often played by trumpeters due to the mouthpiece and is often used to produce a high-pitched slide effect such as that found in Pop Goes the Weasel and similar novelty songs. Because this is not a frequently used instrument, the piccolo trombone is not commonly carried in brick-and-mortar music stores, although it can be purchased from some online stores and manufacturers. The cost for this instrument tends to be relatively low. Moving from the highest pitched trombone to the lowest, the cimbasso trombone is usually tuned to the key of F, although variations in C and Eb can also be found. This instrument is one of the few remaining ‘bent’ trombones, with the large bell (usually 11 to 12 inches) typically found above the musician’s head. The bell is usually detachable, to allow for easier transportation and storage. Frequently featuring a tuba mouthpiece, the cimbasso is a valve trombone and comes with anywhere between three and six valves, both piston and rotary. Similar in tone and volume to the tuba and contrabass, the cimbasso can play quicker musical parts than either instrument while still delivering the same warm, rich (and sometimes frighteningly menacing) tones. Frequently used in opera compositions (Verdi and Puccini were particularly fond of this instrument), the cimbasso trombone is also often used in movie and television soundtracks, military marching bands, and has more recently found its way into the jazz world. The cimbasso trombone is one of the most expensive of all trombone types, running from around $5000 all the way up to $10,000 and more. First popularized by (and actually invented for) jazz virtuoso Maynard Ferguson, the Superbone is the most recent instrument in the evolution of the trombone. The only member of the trombone family to utilize both a slide and a valve system, the Superbone first burst on the jazz scene in the late 1970s. The most versatile (and among the most difficult to play) trombone on the market, the Superbone – also sometimes called the double trombone – can be played as either a valve or slide trombone, or as a combination of both. Usually keyed in Bb, this instrument allows for a much wider range of notes and tones than other trombones, particularly when both the slide and valves are used. Rarely seen outside of the jazz world, the Superbone has slowly grown in popularity over the years. Although it is a complicated hybrid, specialty instrument, the Superbone is not as expensive as many other types of trombones, usually costing between $900 and $2,000 dollars. They will usually be found exclusively in online music stores, or as a special order item. The plastic trombone is another relatively new innovation in the trombone world. Usually used by younger and beginning trombone students, these almost exclusively slide instruments. Featuring the standard slide positions, most plastic trombones are tuned to Bb and will usually approximate the size of, as well as the sound produced by, the brass straight tenor trombone reasonably well. Due to their llightweight– usually two to four pounds – these are widely used in schools as a training instrument for children too young to handle the weight of a brass instrument, and as practice instruments. A smaller variation that is about half the size is also manufactured by some companies, and usually weighs around 1.5 pounds. Plastic trombones usually run between $80 and $200, and can be found in most online and traditional music stores. The sackbut is the predecessor of the modern day trombone, and was most popular between 1600 and 1800 (the first known sackbut was made in 1551). The sackbut was frequently used in sacred and choral music, as well as the chamber and ‘light’ music of the time, and some early opera compositions. The instrument was most often tuned to the key of Bb (or A at that time). Similar in size and design to today’s straight tenor trombone, the sackbut utilized a telescoping slide to change notes; however, the bell was significantly smaller (oftentimes under four inches) severely diminishing its broadcasting ability. The bore was also much smaller than is found on today’s trombone, limiting its range. Today, the sackbut is rarely used outside of ‘authentic’ medieval and baroque / renaissance groups performing traditional chamber music. They are most frequently seen in the United States at renaissance festivals around the county. No longer manufactured on a wide scale, some European manufacturers will produce the sackbut on a custom-order basis. It is not uncommon for the musicians who play them to cobble together their own sackbut-like horns from other brass instruments.